The cause of the blast at a property in Chippenham is not yet known. That's all from us for this evening. We'll be back from 7am tomorrow with more live news, sport, weather and travel updates from around the West of England. Claire Carter, presenter of the breakfast show on BBC Somerset, has been to RNAS Yeovilton ahead of The Great Wellington Walk. 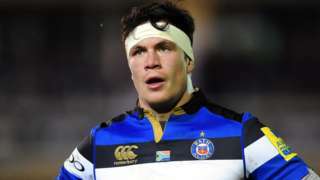 Bath flanker Francois Louw is suspended for three weeks after pleading guilty to making contact with the eye area. BBC reporter Marie Indge sent this video of the emergency services in the middle of Chippenham. An explosion in a third-floor flat near Market Place has left a man with serious burns. As Bristol Hippodrome stages War Horse, the star of the show was earlier making friends with some of Avon and Somerset's equine finest. One of the puppeteers, Samuel Parker, grew up in Bristol. He plays the hind of Joey (the horse). A demand that opposition political parties in the council stop playing "placard politics" and work with him to "get things done"
A rejection of setting a 'no-cuts' budget and carrying the "attitude of previous administrations of kicking difficult decisions down the road"
An "intention to implement a policy where roadworks are not idle throughout the day"
Marvin Rees has also said in his speech tonight that he intends to retain a scheme to cut council tax for the city's poorest residents for this year. The Bristol mayor had said the council can no longer afford to run the Council Tax Reduction Scheme. But opposition councillors said plans to cut the relief scheme were "potentially illegal". Tonight he said: "We are also the only core city that retains the full council tax reduction scheme, and with the support of my Labour colleagues, for this year at least, will recommend to full council that we retain this scheme intact." Dorset Fire and Rescue Service says volunteers from the British Red Cross are at the scene to support those affected by the blast. 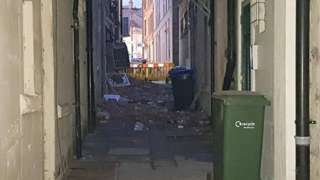 Meanwhile, a building control officer from Wiltshire Council has been asked to check the integrity of the property, which has suffered "significant structural damage". A cordon has been put in place by the Blue Cross charity shop to St Mary Street by the Tesco junction and up to the Market Place by the small short stay car park and Timber Street. The buildings within this cordon are being evacuated and drivers have been asked to avoid the area this evening. State of the City: Did Marvin forget to mention the Arena? Bristol mayor Marvin Rees' speech was 4,826 words long... but not one of those words was Arena. Twelve months ago, he said among other things he'd deliver on the arena by 2019. Tonight, the project was not mentioned. The latest news is that new contractors are working on the plans. But with costs set to rise far beyond the original estimate, will the arena ever be built? Bristol mayor Marvin Rees wants to tear down one of Bristol's largest road junctions to make way for a new waterside residential area. In his State of the City address, which he is currently delivering, he said he wanted to replace the "old, ugly road network" at Cumberland Basin - potentially renamed the Western Harbour. Redevelopment of land on both sides of the river would allow for "more affordable housing to the city centre". We are putting together a proposal that will tear down the old, ugly road network across the western end of the harbour, build a new bridge across the river at a lower point and develop the available land on both sides of the Avon, bringing more affordable housing to the city centre, extending the harbour as a residential area to the west. We may even rename the Cumberland Basin, the Western Harbour. I hope to unveil these plans soon. More on the "explosion" in Market Place in the centre of Chippenham this evening. Dorset and Wiltshire Fire and Rescue Service says it received a 999 call at 6:12pm to say there had been an explosion in a third-floor flat within a mid-terraced building. "By 6:55pm, everyone who could have been in the building was accounted for – one man suffering from serious burns has been taken to Southmead Hospital in Bristol by South Western Ambulance Service," the force adds. A spokesman says is now "downscaling its presence, although investigations into what happened will continue for some time". Emergency services are in the centre of Chippenham this evening after what they describe as an "explosion" near a betting shop at about 6:20pm. One man has suffered serious burns and was treated at the scene by ambulance crews. He is now being taken to Southmead Hospital in Bristol. A cordon has been put in place by the Blue Cross charity shop in St Marys Street by the Tesco junction and up to the Market Place by the small short stay car park and Timber Street. The buildings within this cordon are being evacuated. Drivers should avoid the area this evening. Police and fire crews are on scene trying to find out the cause of the explosion. The founder of collapsed charity Kids Company claims David Cameron's government broke a promise to turn it into a state-funded organisation. Camila Batmanghelidjh says she was told of plans in 2014 to transform it into something similar to Childline, the NSPCC hotline which gets some regular government funding. But it never happened because politicians "change their story and they run," she told BBC 5 Live's Emma Barnett. Kids Company, which looked after vulnerable children in Bristol, London and Liverpool collapsed a year later. New figures show the number of people being treated at the Bristol Royal Infirmary for the effects of a new mind altering drug rose over the summer. The University Hospitals Bristol NHS Foundation Trust says 24 people were treated after taking the drug, known as Spice, last June - compared to about six in an average month. The Bristol Drugs Project says it has also seen an increase in its use mainly among the city's homeless population. Avon and Somerset Police say anyone caught in possession of Spice could face up to five years in prison, and for supplying or producing the drug could be jailed for up to 14 years under the Misuse of Drugs Act. Forty tonnes of rock has been flown through the autumn gloom to the top of Glastonbury Tor. The helicopters from RNAS Yeovilton have helped a team trying to tackle the erosion on the top of the landmark, caused by the large number of visitors. Two grey long-eared bats found injured in Somerset are being nursed back to health. One was rescued in Merriott near Crewkerne in the summer, and another was found in Williton a couple of weeks ago. The bat species is one of the UK's rarest. State of the city: How are those pledges coming along? Twelve months ago, Bristol mayor Marvin Rees said - among other things - he'd deliver on the arena, sort out the city's traffic and bring powerboat racing back to the docks. What will he say tonight?